Walnuts contain zinc, potassium, magnesium, phosphorus, sulphur, iron, calcium, and the vitamins A, B1, B2, B3 and C. In addition, walnuts are rich in linolenic acid, one of the healthy Omega-3 fatty acids, more than any other type of nut. Walnuts have been part of the human diet as early as stone and bronze age. Many thousand years ago, walnut trees were growing in Persia. Today, California, USA, is the main agricultural area for this extremely healthy nut. Special choice quality can be found in French walnuts, sometimes they are even on sale with designation of origin (e.g. Grenoble). Walnut trees grow up to 25 m high, they are the namesakes of the family of walnut plants and are originally from Central Asia and Iran. Today they can be found in many warm, mountainous regions worldwide, the main exporter is California. Walnuts are enclosed in a brown, rough shell. They have been cultivated for over 9000 years while the use of their trees as supply for the sought-after and expensive wood remains a backdrop. 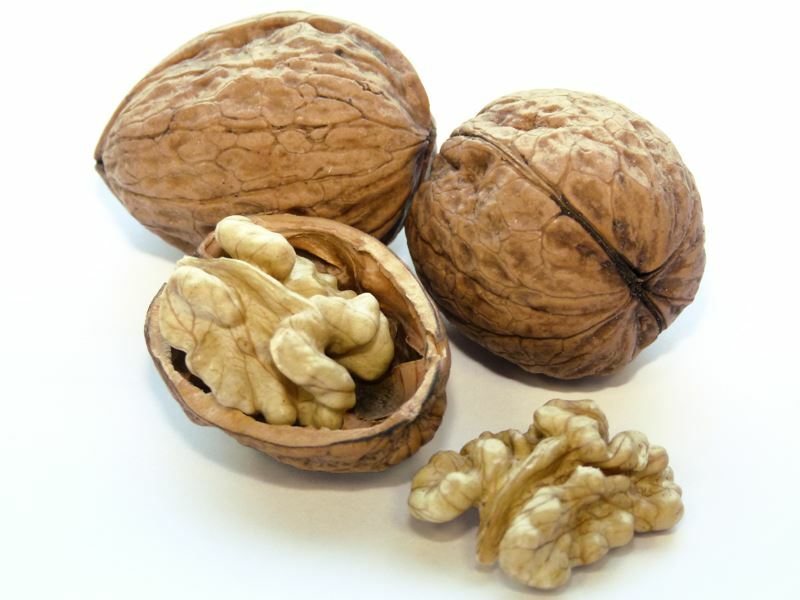 Walnuts are used in several dishes, for example in cake, pastry, ice cream and other desserts but also in sauces and salads, they can be processed to walnut oil, and they are a popular snack. Raw walnuts are nicely crisp, aromatic and tasty.